OWU’s Nick Heidel (8) returns an interception in the first quarter of the Bishops’ 40-12 win over Hiram to close the season Saturday afternoon at Selby Stadium. 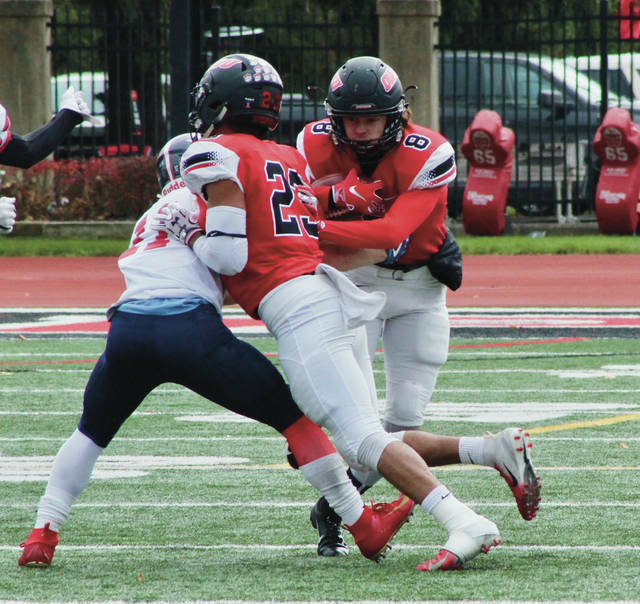 The Ohio Wesleyan football team overcame two early turnovers thanks to a strong performance in all three phases of the game to notch a 40-12 victory over Hiram in the season finale Saturday afternoon at frigid Selby Stadium. Cornerback Nick Heidel sparked the Battling Bishops with a 28-yard interception return that set up the go-ahead score – a 5-yard touchdown run by Trey Dixon for a 7-0 lead with 6:08 left in the first quarter. Heidel’s interception came one play after a Deji Adebiyi fumble while fighting for yardage on a 20-yard reception on OWU’s second possession. Freshman quarterback Jeremy Robinson, making his second start in as many games, threw an interception on the Bishops’ first possession. He recovered to throw for 145 yards and two touchdowns. Adebiyi redeemed himself with a 15-yard touchdown reception late in the second quarter and Kenny Streib caught a 30-yard pass from Robinson in the third for OWU’s final touchdown. OWU’s punt team accounted for the second score. Up-back Curtis Duren took the snap and found Sterling O’Hara, who took it 56 yards for a touchdown to give the Bishops (4-6, 4-5) a 14-0 lead with 10:53 left in the second quarter. The defense made it a clean sweep when Cody Streit strip-sacked Hiram quarterback Randy Tucker, scooped up the fumble and returned it 54 yards for a touchdown to give OWU a 24-0 lead with 2:59 left in the half. Streit’s touchdown was the fifth defensive touchdown by the Bishops. The Bishop punt team highlighted the second half. Robinson pooched a pair of third quarter punts that were downed inside the Hiram 1. Heidel, the team’s regular punter, would not be outdone. He booted a 61-yard punt that was downed inside the 1 with less than a minute left in the third. Defensive tackle David Praul turned it into points with a sack of quarterback Hiram quarterback Randy Myers Jr. on the first play of the fourth quarter to push the lead to 40-6. A.J. Daniels returned a kickoff 95 yards for a touchdown to get Hiram on the board with 1:18 left in the first half. The Bishops took a 31-6 lead into the locker room. Myers orchestrated a 99-yard drive for the Terriers (2-8, 1-8) late in the fourth, capping it with a 22-yard scamper to account for the final margin.